"Another solitaire card game variant you might appreciate"
The freeware download offered here is called Osmosis Solitaire. It’s a solitaire card game variant also known as Treasure Trove, played with a standard deck of cards. Elsewhere on Winportal we yet presented a wide range of solitaire alternatives and this one has particularly simple rules. 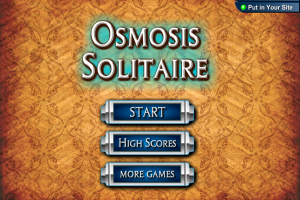 Nevertheless, Osmosis Solitaire is not a simple video game. Here’s not the place to go into the details about these rules, which the die-hard solitaire players among you might want to find out themselves as doing so can be considered part of mastering the variant, hence being part of the fun of playing a new version. So, the only way to know what makes Osmosis Solitaire so special is by proceeding to the free download and starting to play it. Get it right now and have fun while you discover what’s it all about.